Hi Friends! 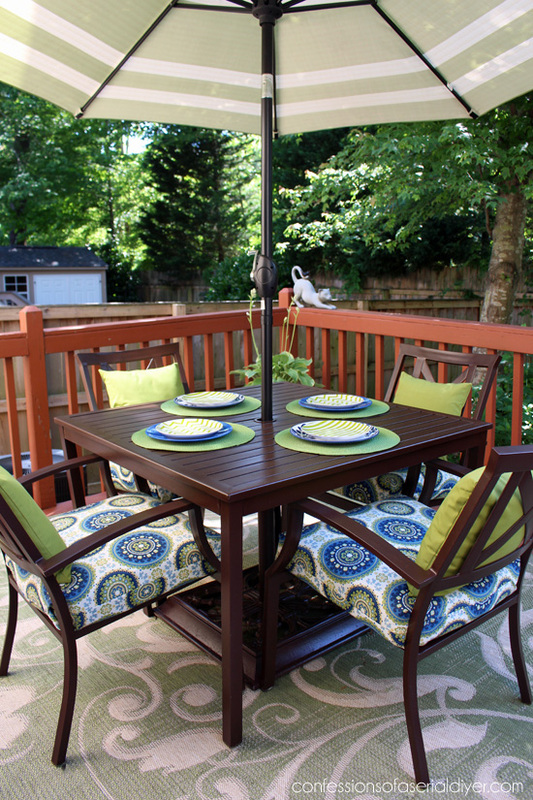 The rain has finally given us a break around here, thank goodness, and my back patio furniture has been desperately crying out for a redo…just in time for this month’s Design Challenge: Outdoor Décor! Seriously, I think I hear it sobbing in the middle of the night, ya’ll. See what I’m talking about. Ew. The cushions covers are about two years past due. That rug is just pitiful, and the umbrella was a rescue from my Mom’s trash. 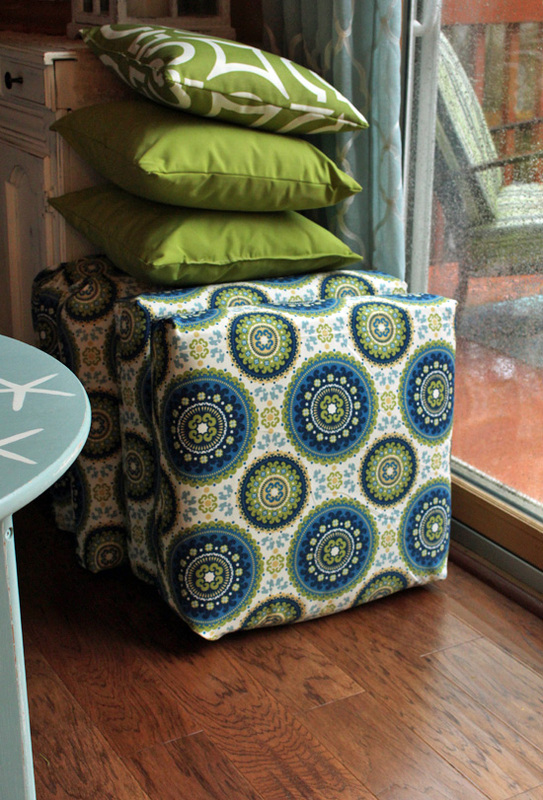 I knew I wanted to cover my old faded patio cushions in the same fabric. And here she is…ready to party! It looks like a totally brand new set, right?? This set is part of a larger set that I bought when I had my last house. We had an inground pool and needed a bunch of furniture to go around it. There is also a sofa, two chairs, and coffee table that match. 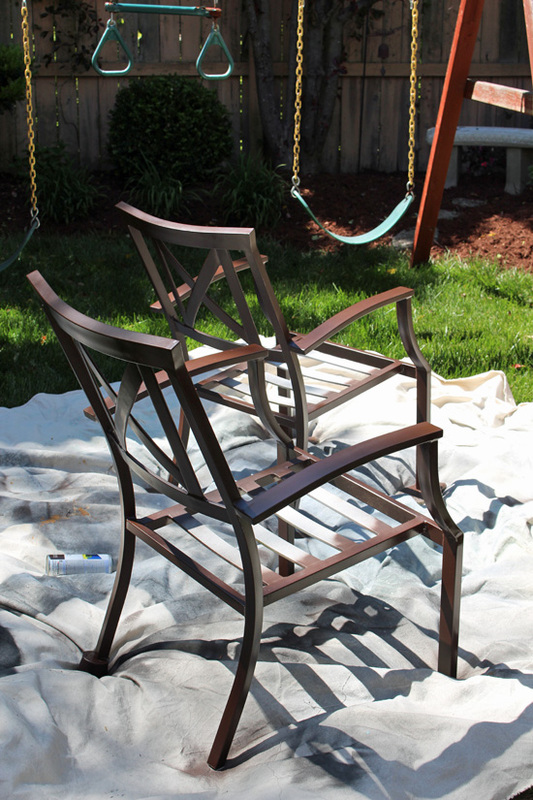 It was originally white with light green cushions, but I sprayed it brown when I moved here. I just gave it another quick coat to freshen it up! And now it looks new again! I love you, spray paint!! Every year I tell my husband that we really need to start looking for a new set. This one is over ten years old, but it comes up so dang good each time I freshen it up! 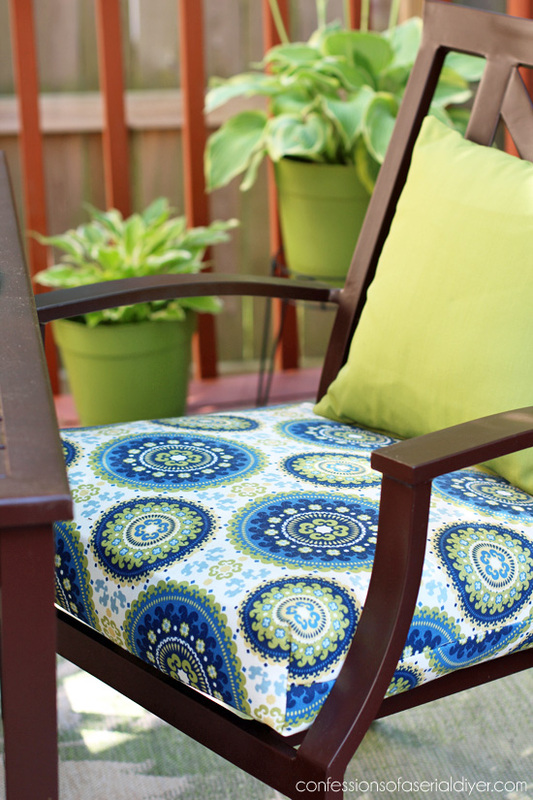 I used my Sew Easy Outdoor Cushion Cover Tutorial to make new chair cushion covers. 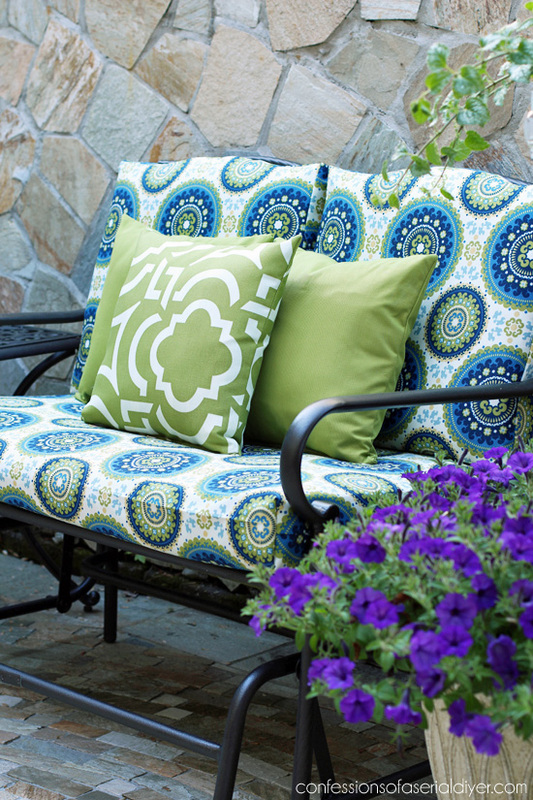 Stores want a fortune for a full set of replacement outdoor cushions. If you’re able, sewing your own is definitely the way to go. 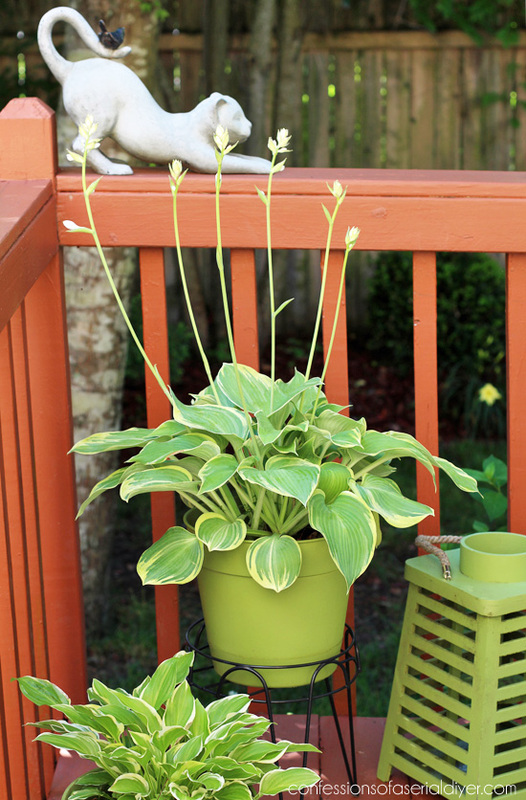 Still looking great, and my hostas have really filled in since then. They are my favorite filler since they come back every year! 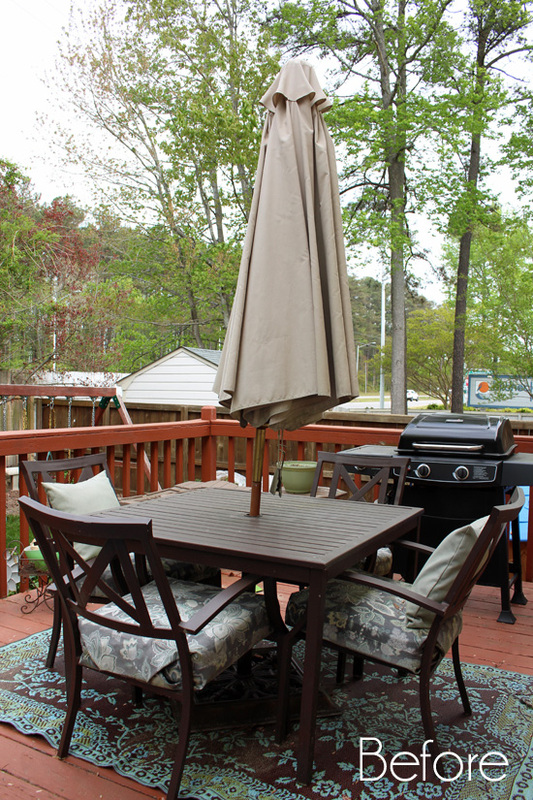 See how our deck is really elevated on the right? The people that originally built the deck built it around a tree. That tree eventually outgrew the width of the opening and started lifting the deck with it. We had the tree cut and filled in the decking, but the stump is still hanging out beneath. It doesn’t really bother us at all. And thankfully it finally did! 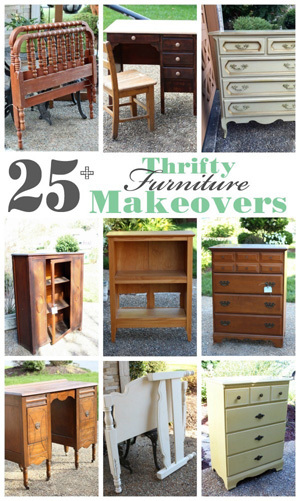 Now the rest of the furniture out here needs it’s own makeover. 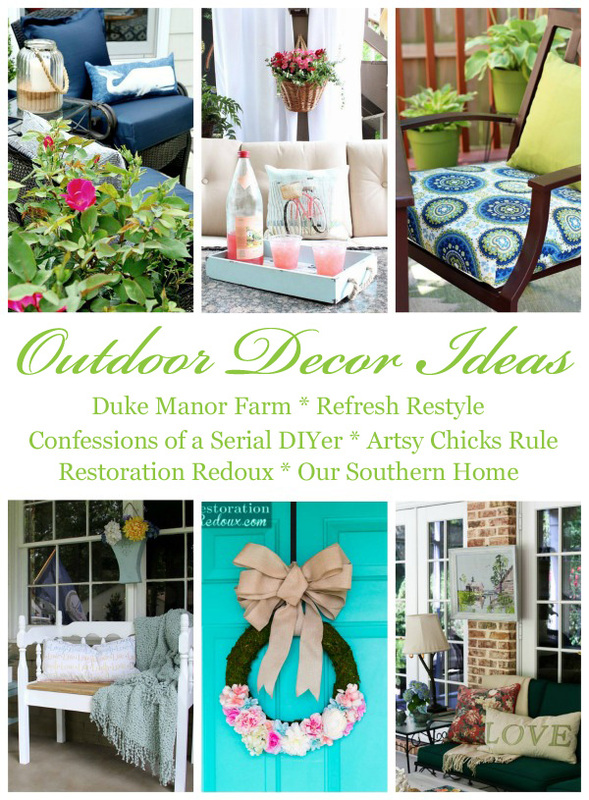 My Décor Enthusiast Girls are sharing their own outdoor décor ideas today as well. 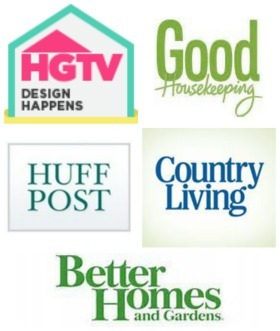 Visit them at the links below the graphic for tons of inspiration! 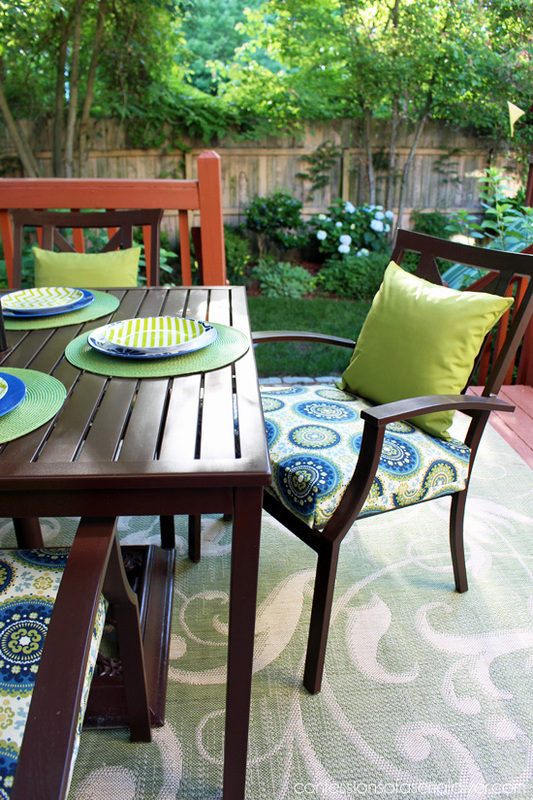 Got any outdoor décor ideas you want to share? You can!! 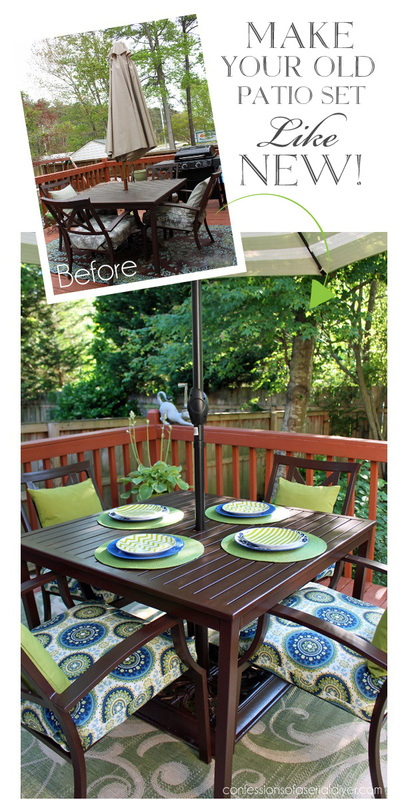 Take pics of your favorite outdoor decor and share them with us on our Decorating Enthusiasts DIY Forum on Facebook! We created this forum not only so you could participate in our fun decorating challenges, but also so that you have a judge-free zone to share your projects any time, ask questions, and hang out with other creatives just like you! We will choose one winner that will be featured on all six IG feeds this Sunday!! 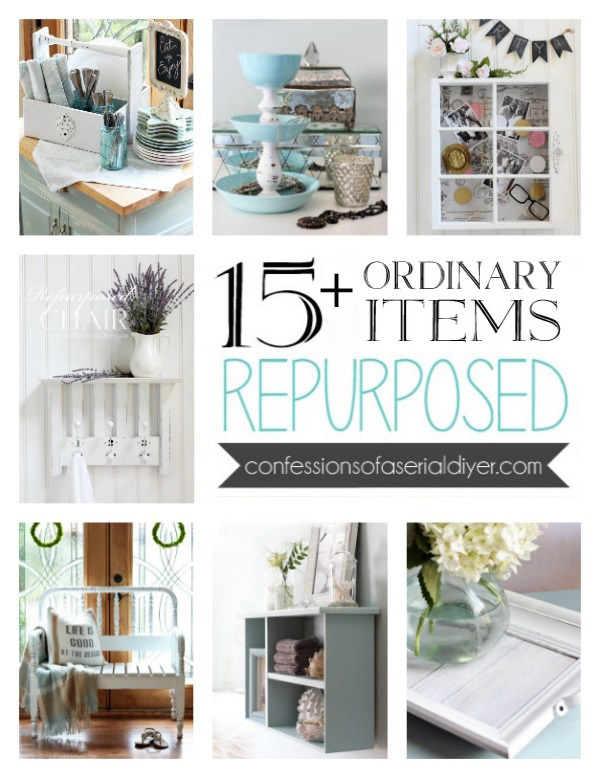 I love looking through all your amazing ideas! Hope to see you there! 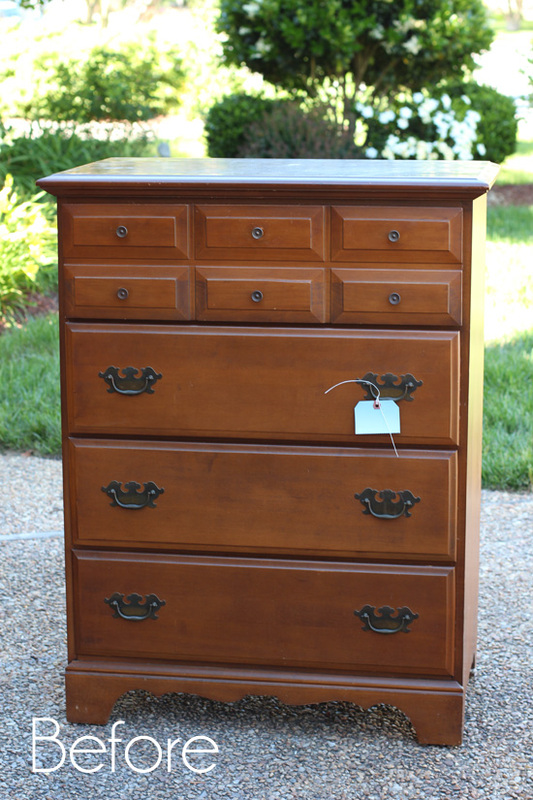 UPDATE: Check out how this dresser looks now HERE! You are so talented! 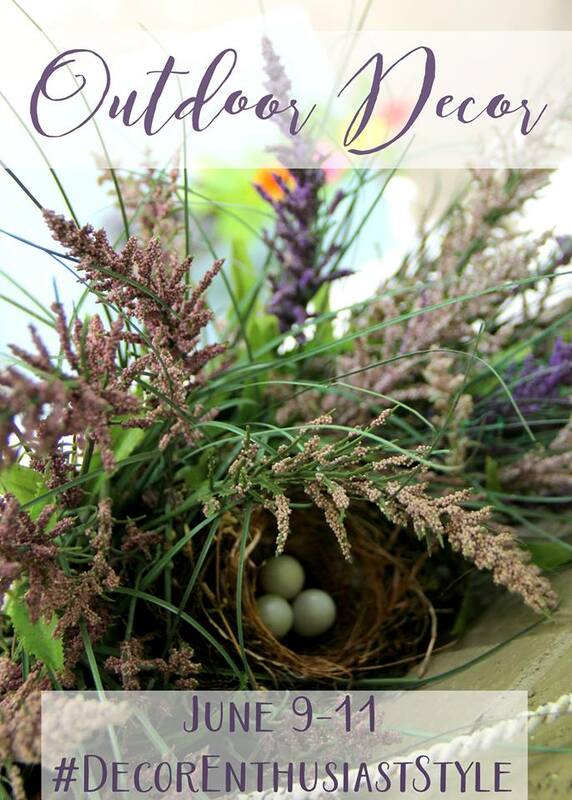 I love all you outdoor decor ideas and DIY projects! I need some sewing lessons! It’s so inviting, Christy! That did it, I’m going to recover my horrible, 15-year-old cushions. Mine are one long piece for the back and seat, but I’m guessing I can cut them apart and use your technique to make separate back and seat cushions. It’s worth a try! I also have my parents’ 50-year-old wrought iron bench that used to be black but is now green. If the rain ever lets up here, it’s going to get a fresh coat of paint, too. Gotta love spray paint! Christy, These look so amazing! Thank you for your inspiration!!! 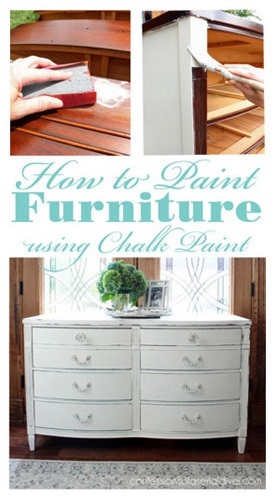 What brand of spray paint do you use? 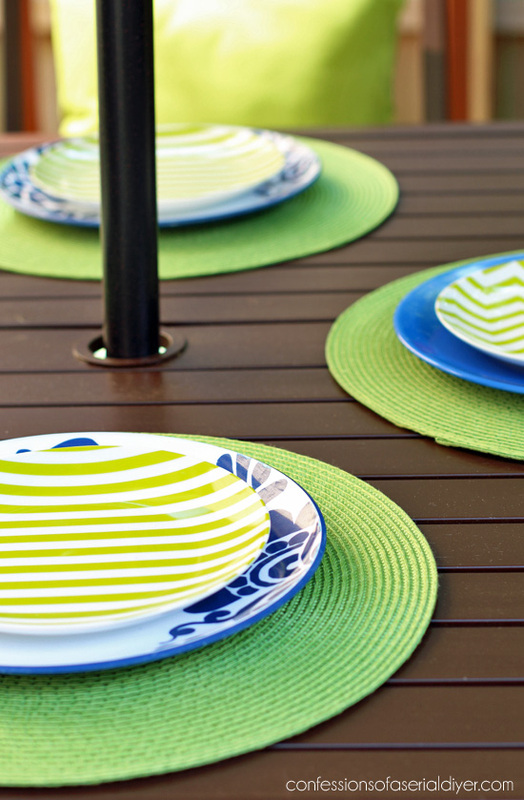 I used Rustoleum for plastic on some poolside furniture 5 yrs ago and it still rubs off on people. Oh wow I’ve never had that happen! 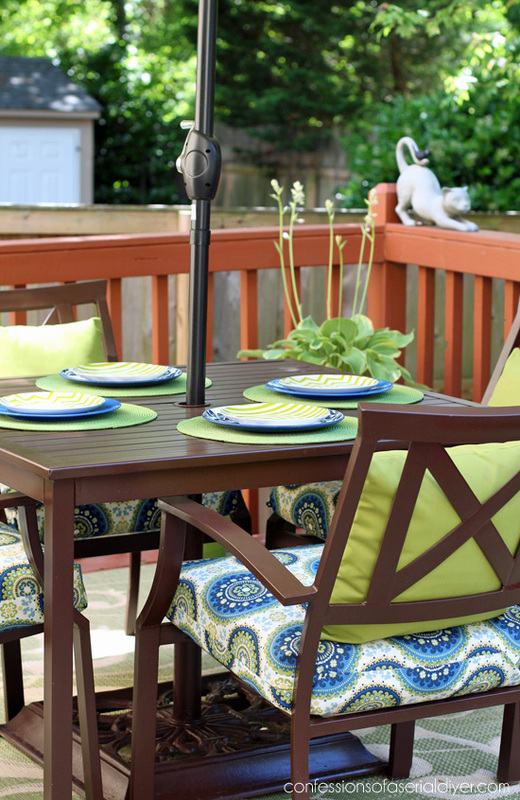 I use Rustoleum American Accents on my outdoor set with no issues like that. I wonder if it had to do with pool chemicals? your patio chairs texted me this morning and told me how much happier they are now with a new coat of paint and chair cushions. they said thank you. Ha ha!! I think they were having a party after we went to bed Saturday night lol. 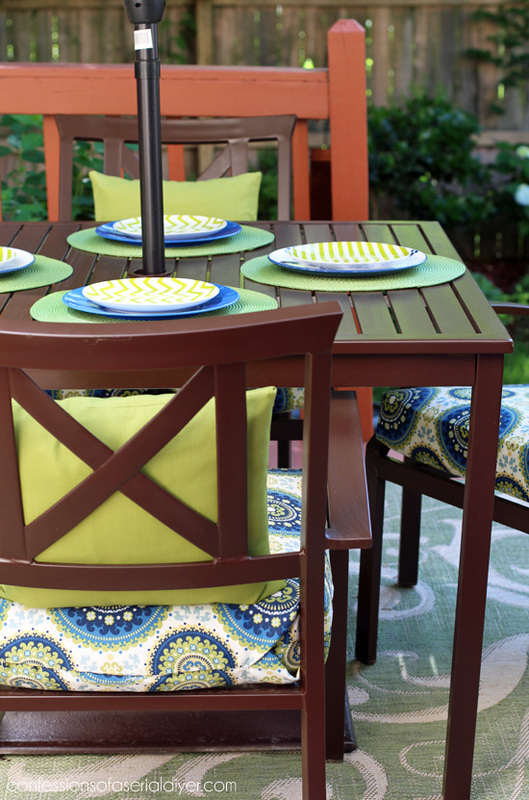 Christy I SO love what you did with your patio furniture! It’s amazing what a little paint can do. Can’t wait to get started on mine! Thanks for the inspiration! The fabric choices are just beautiful! I need to sew new cushions for my set. I love that new rug….mine needs an update as well! Just beautiful! Love the colors that you used. Also, love your concrete kitty kat on the deck railing. Looks great! I’m sure this is a favorite place to hang out! So, so pretty! Love the colors!! Wow girl you did a wonderful job. 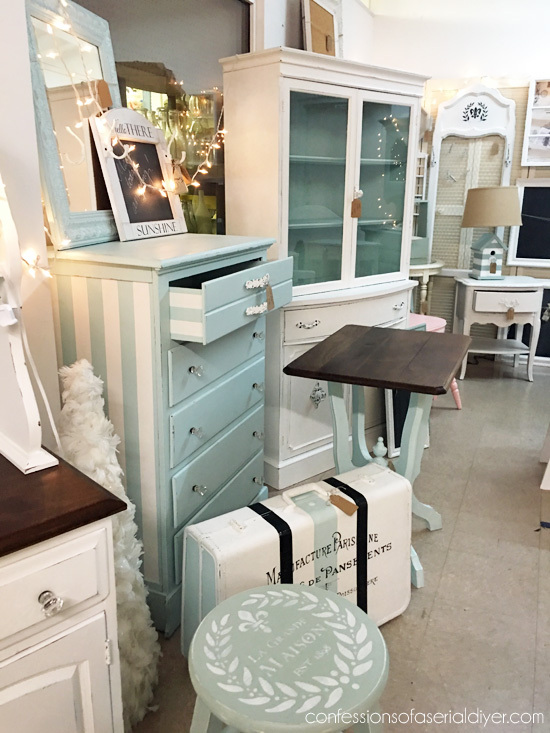 love that fabric, and the green you put with it is just perfect, and with that fabric and the different colors you can easily change the accent colors. Your deck and yard look so pretty, I’m so ashamed of the way my patio and flower beds look, I have all kinds of summer bulbs and plants I should already have in ground. If it’s not raining the cotton pikin wind is blowing so hard you can’t get out and work. Thanks so much, Patty! It was long overdue, but it always feels great to tackle those big projects. And I hear ya with all the rain…this has been the wettest Spring I can remember! Wonderful make over!!! Really looking fab!!! Can you move in and fix all these things for me??? The “rug and new fabric” pic-where did that go? Did you sew the green fabric on top of the brown rug? 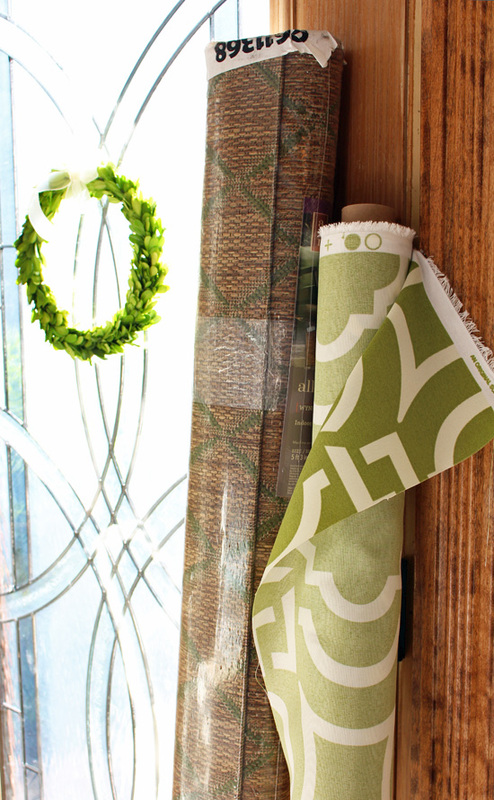 That green roll doesn’t look to be the same as the rug on the finish…eh? Am I missing something here? Beautiful! 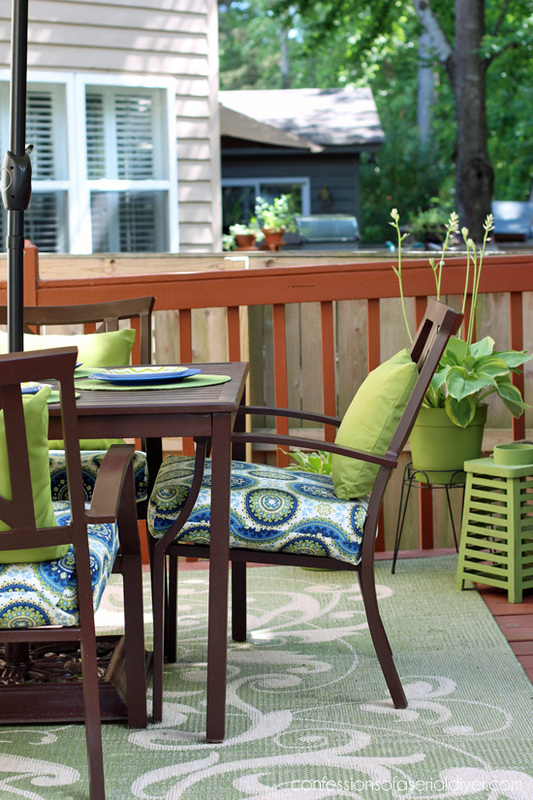 Love that color green for outdoors, it just says Happy Summer Everyone! Wishing you happy memories made, much laughter and relaxing summer nights!! 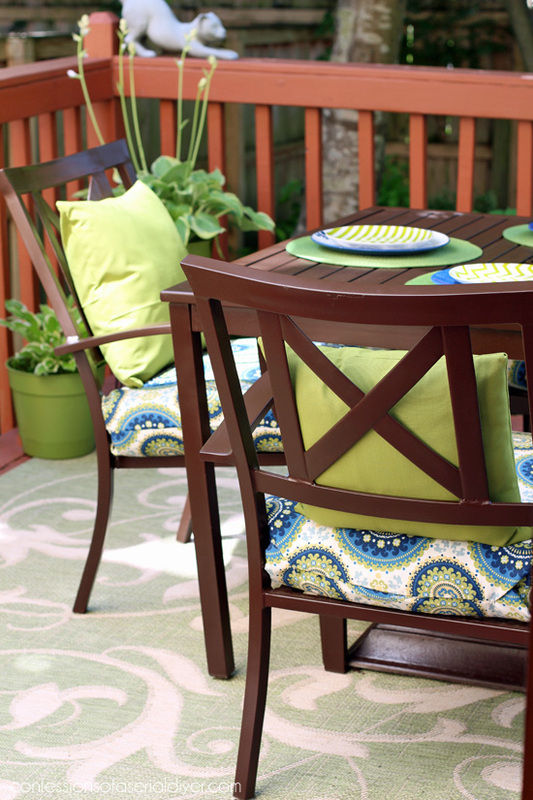 How exciting Christy to have that fabulous fabric to look forward to using on the rest of your patio furniture! 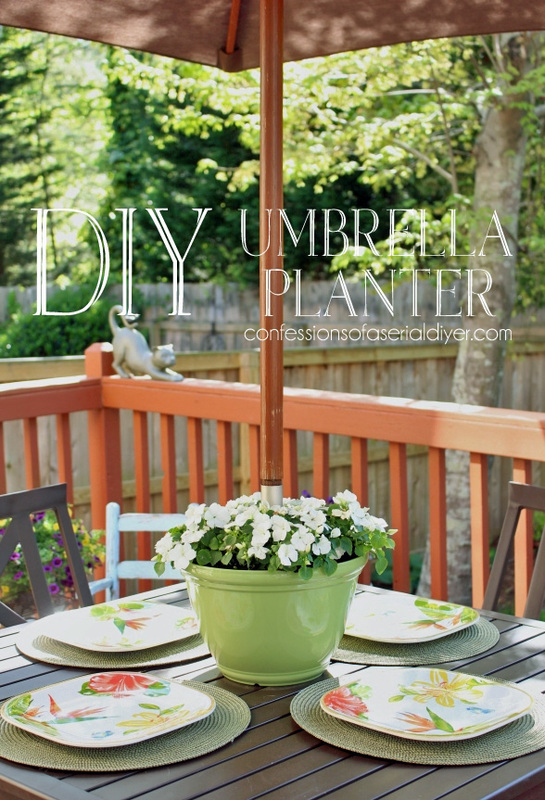 Gosh, your patio is soooo beautiful! I do like the rug you currently have under your table. 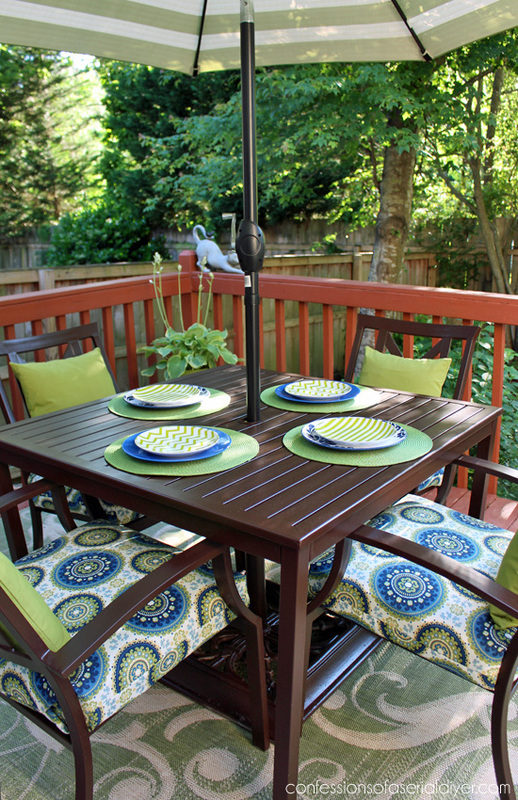 Thanks so much for sharing your outdoor décor. I loved it!